Sometime around the middle of last year many access control industry insiders noticed a welcome phenomenon: People were smiling more. At trade shows, around industry round tables and across boardrooms, a collective weight seemed to have lifted. As the economy finally shrugged off the doldrums and businesses started loosening the purse strings, those manufacturing, selling and installing access control saw momentum — whether for the first time since the recession or as a continuation of a recovery begun a year or two earlier — that led to a positive 2014 for most and a rosy outlook for 2015. This is reflected in SDM’s 2015 Industry Forecast Study. SDM readers were contacted in the fall of 2014 about their opinions of the state of the market in 2014 and their expectations for 2015. Nearly 70 percent rated their current access control market as good or very good/excellent in 2014. When asked to predict how the market would fare in 2015, there was a substantial gain (9 points) in the percentage of respondents who expected the access control market to be very good/excellent. (See charts on page 51). “We fared better than we budgeted for or expected in 2014,” says security integrator Skip Sampson, CPP, president, KST Security, Indianapolis. Sampson, who is featured on this month’s cover, attributes this growth in large part to the general economic recovery. Christopher Sincock, vice president, security business, DAQ Electronics LLC, Piscataway, N.J., says the positive atmosphere was palpable. “There were more smiles the second half of 2014. While many in the industry reported similar growth numbers, a few outstripped that by quite a margin. There are concrete reasons for this optimism. 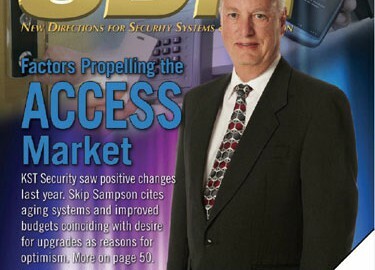 Along with a freeing up of funds for both old and new projects and a rise in construction (see chart on page 55), access control systems are quite simply “aging out.” This fact, timed as it is with rising optimism in the economy and businesses’ willingness to spend money, is good news for the access control industry. Beyond software, another sea change has occurred within that seven-year technology cycle: the rise of the “Internet of Things.” While not a direct driver for security yet, this is an entire mindset taking over the consumer side of life, and many expect that to bleed over to the industry sooner than later. Everyone is a consumer, says Andrew Elvish, vice president of marketing and product management, Genetec Inc., Montreal. “It’s my mantra. We all have smartphones; some have Apple TVs or home automation. Even though we are a B2B business, people’s expectations are set in many ways by their experience as consumers. “There is a refresh period going on in terms of technology. In the past six to seven years, the tech gap between what they have and what they can get is so compelling it is time to make that move. And concerns around security both physical and logical are very present in those doing risk assessments,” Elvish reasons. As more and more IT departments get in on the security upgrades, this could be a significant factor. Finally, there is the fact that U.S. corporations are sitting on more cash today than ever before, after hoarding it for years against a sluggish economy. Moody’s, a credit ratings company, reported that U.S. company cash levels reached a record level $1.65 trillion in mid-2014, according to an October 2014 Reuters article. What does more money to play with, a willingness to spend it, the need to upgrade end-of-life access systems and new types of buyers with a keen interest in technology add up to? A whole lot of opportunity. In addition to the big things that are adding up to a very optimistic outlook for access control, there are also some ongoing inside industry trends with the potential to impact sales both positively and negatively. As a whole, access control is not a fast-moving industry. Often, what is “new” to the average end user has actually been around for several years; but only after it is proven and they see others implementing it will they jump in. For example, the survey found that while 75 percent of respondents felt cards with cryptography were important, the majority also believe that mag stripe and proximity technologies provide adequate security, despite their vulnerability to cloning. This is a trend across the board, Genetec’s Elvish says. While his company experienced strong growth in 2014 in line with others’ performances, it wasn’t as strong as they had expected, due in part to platforms being discontinued and companies (both manufacturers and integrators) being acquired. As the industry was busy consuming itself, those watching — particularly the new breed of buyers — went into “wait and see” mode before committing. These new people are influencing buying decisions and that is a trend that will continue. Like it or not, access control and the security industry in general have to embrace IT and IP (Internet Protocol) and the new breed of decision makers who live in these worlds. So what you have going on in the industry is a push-pull of those who feel that the traditional panel/card reader (often proximity) systems have worked for them and continue to work and those that understand the power of IP and the potential it can bring. The age of the traditional panel is waning and the IP/network/edge infrastructure is waxing. The trick is negotiating the transition. What that means is even though video is often considered “king” in the security world, access control actually has the advantage when it comes to being the kind of solution that is considered normal practice in an IT department, he explains. It is impossible to talk about access control today without also talking about “what else?” Access systems are rarely standalone these days and more and more customers at all levels expect it to be integrated, at a minimum, with video and intrusion detection. 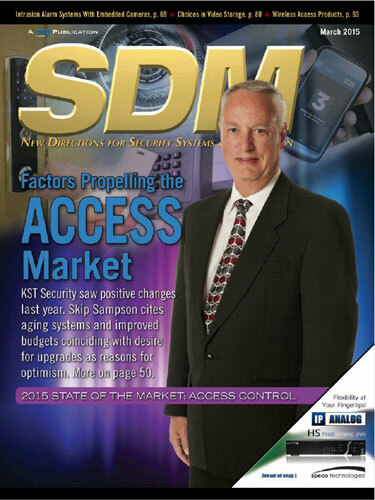 In fact, 60 percent of SDM’s Industry Forecast responders expected sales of integrated systems to increase in 2015, ahead of access control at 55 percent (see chart on page 51). This is a number that has been steadily climbing over the past few years. “At the end of the day, everyone has that, even the smaller operations by virtue of number of doors often have more cameras than doors under access control,” he says. What has changed and is changing, however, are end user expectations for what that integration can do for them. They no longer have to be persuaded that integration is a good idea. They know that. Now the conversation is about the how and the what. While access control may be a “slow moving” industry, that doesn’t mean there aren’t new technologies being developed all the time. Two of the hot-button discussion points of the past year have involved the buzz around NFC/Bluetooth, and wireless online locks. SDM asked experts to weigh in on these technologies relative to their influence on the market in 2015 and beyond. This is probably the top thing people are talking about in the industry. Interestingly, integrators mostly agree that they hear much more about this from manufacturers than they do from their end users. Still, the whole consumer expectation discussion would not be complete without contemplating the No. 1 technology of the decade: the smartphone. Putting aside whether near field communications (NFC) or Bluetooth low energy (BLE) will ultimately be the technology of choice — or whether there will be room for both — many insiders feel the phone as credential has the potential to be a “disruptive force” on the industry. Others aren’t so sure smartphones will be a big factor any time soon. Still, there is a Unisys statistic that it says takes 26 hours for the average person to report a lost wallet, but only 68 minutes to report a lost or stolen phone. The emergence of a new class of readers from the likes of ASSA ABLOY and Allegion are set to position wireless technology as one to watch for 2015. Not all integrators are comfortable with wireless yet, but if they can get there, it can literally open up new doors — and new business. Read the original article at SDM Magazine (login required).